Can we use the tunnel this time? I’ve never been much enamoured of what are often described as dexterity games. You know the sort of thing: Jenga, Tumbling Chimps, and so on. But once in a while they can be fun and in that spirit I recently picked up a bargainiferous copy of RoadZters, which is a racing game where you proceed around a track (which looks like a Scalextric track without the grooves) by means of flicking a “Z-ball”, a ball with a cluster of ball bearings inside it which makes it behaves in odd ways which are, I am led to believe, controllable with practice. When the ball stops (assuming it is on the track) you place your car there and the next player flicks the ball from where their car was left last turn. Simples. The blue car may well get into the lead here, but I think Miss B needs to keep her eyes on the road. So it turns out that this is quite a lot of fun, though frustrating at times as an over-cooked flick can send the ball flying off the track and under the sofa. We soon learned that using blankets, cushions and the like to frame the play area can save us a lot of time looking for the lost Z-ball. Miss B had even more difficulty with the game than I did, but despite the frustration, she got around the course and then wanted to play again. And again. And even when I had to go off to do something else for a while, she kept going to practice her flicking. 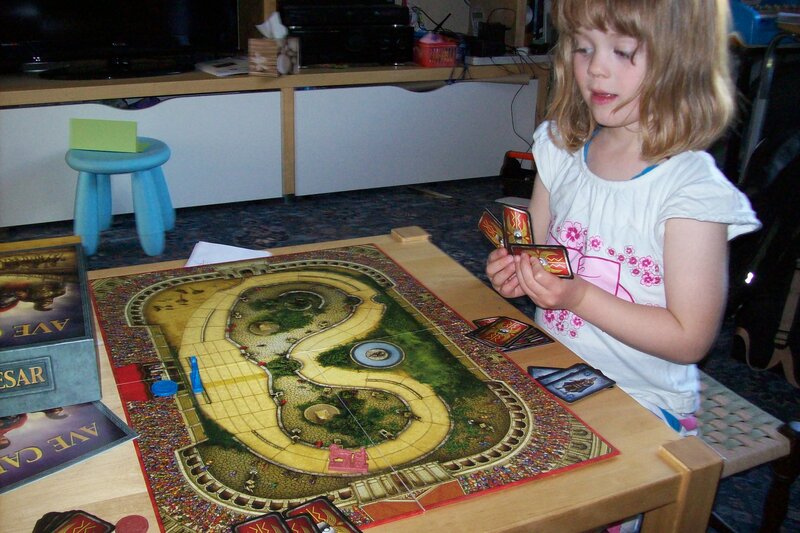 The set we bought is enough for some good races with several different track layouts, but for playing with Miss B it would be nice to have more barriers to go around the track to just make things a little easier. Extra barriers are available (as are many other bits) in expansion packs, which I would certainly buy if the opportunity arose. 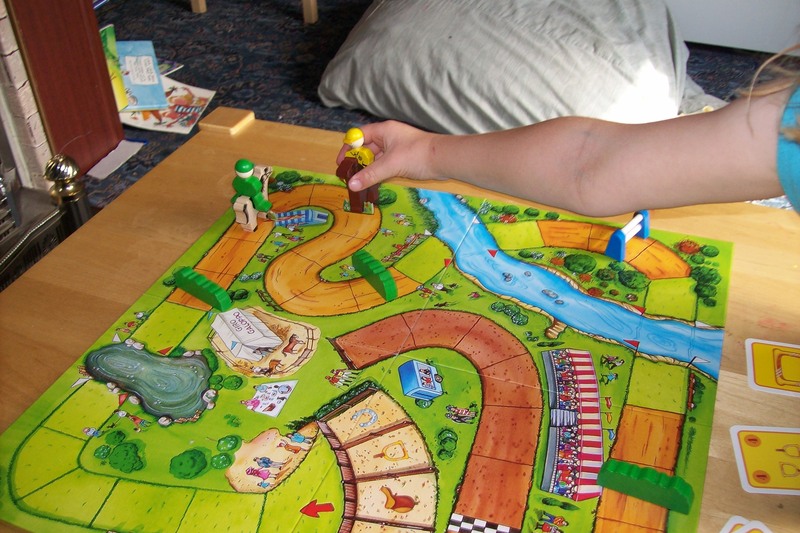 The game: RoadZters (Cepia Games), 1 to 4 players aged 5+. I was reminded of Robo Rally recently and thought to myself that it’s a fun game that we should try playing sometime. Bleeding ambitious though, so this would take a little thought on the best way to approach playing with a 5-year-old in a not-completely-trivial way. I think we ended up with something pretty workable. So, what we did was ignore lasers and option cards, and we chose what I figured was the most straightforward board (“Island”), with just two flags to visit on opposite edges of the board, so there was a route which avoided conveyors, etc. (though I chose to go via the conveyors to demonstrate what happened). We then, instead of programming the whole turn at once, worked through each register phase, choosing a card for each move as we went along. After a few turns I switched to setting up the five cards in advance, which made things a little more fun — and I’m kicking myself for not thinking of that at the beginning of the game. All-in-all this setup seemed to work pretty well. Miss B needed a little help with getting the right and left rotations straight in her head but, to be fair, that’s the case with many adults too. She didn’t like the idea of the lasers and having damage, so I’m quite happy leaving that out for the time being. I think she enjoyed it as an unusual sort of race game but, for the moment at least, robots directly interfering with each other (via lasers, shoving, etc.) is not what she wants to see. Maybe we’ll introduce some of those elements later. Oh, and painted miniature robots make for instant win, even though I still need to paint the bases on them. Maybe this is sufficient incentive for me to finally finish the job. Overall I think things went very well and I expect we’ll be playing again, though I have no idea how long it will be before we develop into doing the programming aspect of the game. It probably won’t be soon. 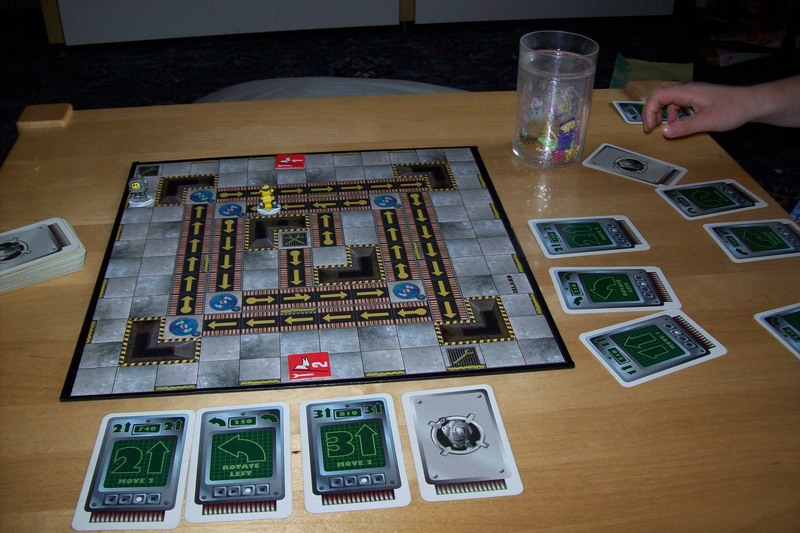 The game: Robo Rally (Wizards of the Coast), 2 to 8 players aged 12+. At last it’s time to bring out the big guns of one of the all-time classics. Unfortunately we only have the re-released version without the 4-player board and with not quite the same level of stuffage as the original edition, but Ave Caesar is still Ave Caesar and is a standard by which race games can be measured, even 20-odd years after its initial release. You may be starting to infer that I like this game. You’d be right. So how does it measure up when playing with a four-year-old? The box says this is for ages 12 and up, but the only simplification I made was to play this with only the two of us (and also to just play individual races with no scoring scheme). The rules are really straightforward and Miss B was quite happy (subject to a bit of a barrage of “why?” questions) with the rule about not playing a six when in the lead. Some of the subtleties of planning moves and counting spaces to hit key locations were lost, but I explained the options most turns and reminded Miss B when she needed to visit Caesar, and other than that it all went fine. Even down to holding the cards in hand. So, we had a ball, with one exception. I won the first game which led to a brief bout of tears. That calmed down quickly with another discussion about winning and losing, plus agreeing for us to have another game — though I did strongly stress that it was entirely possible that I would win again next time. As it turns out, I didn’t win, despite me shutting Miss B out of Emperor’s Alley on the first lap. I’ll get my revenge next time. In future plays we’d like to include Mummy to add some more excitement, and possibly other people if we can find and persuade them. Somewhere down the line we’ll probably try out the unmanned chariots that the rules suggest for filling out the field. Non-player entities are always a fun way to add some chaos to the proceedings! The verdict from Miss B (aged nearly 4½): “I liked it because you winned and then I winned. I didn’t think that I would win but I did.” It’s all about the winning, isn’t it? But she does like everyone having a chance to win. 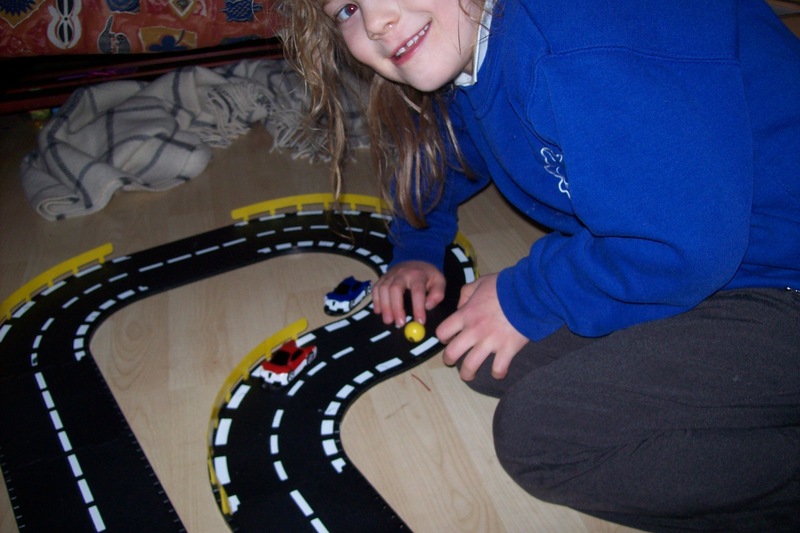 Later conversation gave a little more information: “I really like racing,” and, for the first time, a very high accolade: “Can we take it to nursery?” I’m not letting a treasured game go to nursery, but I’m pleased that she wants to share this with her friends. I said that if some friends came around we could have a go at playing Ave Caesar with them, a judgement which received approval. A little later, Miss B was gushing about the game on the phone to Mummy, who was away for the night, so I think we have a keeper here. 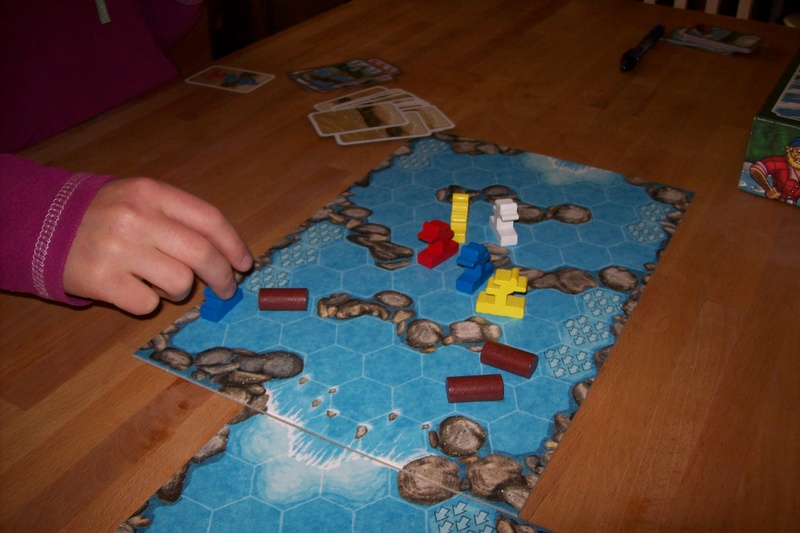 The game: Ave Caesar (Pro Ludo), 2 to 6 players, age 12+. How can Death be an “easy” problem?